PHOENIX — The weather was flipped Wednesday throughout much of the U.S. West, with snow falling on cactuses in the Arizona desert and Anchorage seeing balmy weather — at least by Alaska standards. 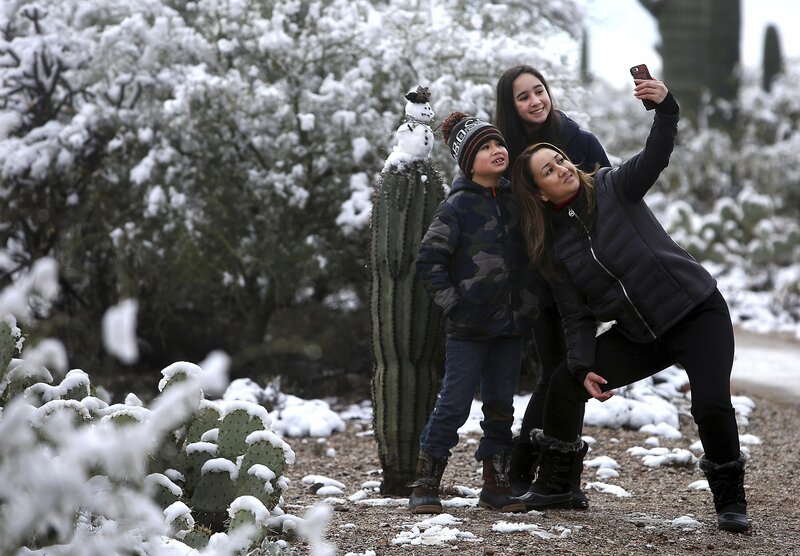 In Phoenix, the overnight low was 30 degrees for the first time in five years and more cold temperatures were expected Thursday. The Tucson area saw as much as 6 inches of snow. Snow dusted cactuses and mountains in southern Arizona and covered the Grand Canyon in the north. Elsewhere, the National Weather Service issued a freeze warning in the Nevada county where Las Vegas is located. Snow fell and stuck Tuesday on a desert highway over a mountain just 20 minutes outside Sin City. Albuquerque, New Mexico, saw heavy snowfall and icy roads that caused many government agencies and schools to close. The cold weather and snow is “quite uncommon” for the area, said Glenn Lader, a National Weather Service meteorologist in Tucson. Nogales, an Arizona city on the Mexico border, had about 6 inches of snow, he said. Even Southern California got a bit of the action, with rain expected as part of already cold, windy weather. Meanwhile, some parts of Alaska rang in the new year with relatively balmy weather for the region that helped melt snow in Anchorage. A change in the jet stream brought warmer air from the south, taking the temperature to 42 degrees on New Year’s Day. It was a nice respite from a winter mix that left 32.6 inches of snow on the ground in Anchorage in December, with most of it falling during the last half of the month. Colder weather was in the forecast, with high temperatures dropping to the teens or even single digits.